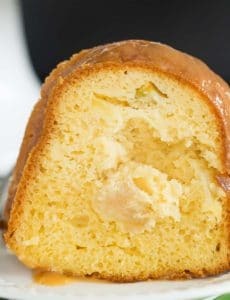 This apple Bundt cake is incredibly easy to make, and is topped with a delicious caramel glaze. Make the Cake: Preheat oven to 350 degrees F. Grease and flour a 12-cup Bundt pan. Using an electric mixer on low speed, beat the cake mix, pudding mix, water, eggs and oil in a large bowl until blended, about 30 seconds. Increase the mixer speed to high and beat for 2 minutes. Gently stir in the chopped apples and transfer the batter to the prepared Bundt pan. Bake for 50 to 60 minutes, or until a toothpick inserted in the center comes out clean. Cool for 20 minutes, then turn the cake out of the pan and onto a wire rack to cool completely. Make the Caramel Glaze: In a medium microwave-safe bowl, combine the caramels and heavy cream. Microwave on high until the caramels are melted, stirring every 20 seconds. This will take about 2 minutes. Set aside to cool for about 10 minutes, until thickened. Slowly drizzle over the top of the cooled cake and let it drip down the sides. Allow to set for about 30 minutes before serving.